Mala is the sanskrit word for garland. It is typically 108 beads, in addition to the guru bead and is used as a meditation tool while chanting, reciting or silently repeating a mantra. They help the wearer focus their minds. When not used for meditation, they can help wearers carry a sense of peace, calm, mindfulness, and focus with them throughout their day. As a Birth Doula, I often will make a mala with my client prior to their birthing day. When used in birth, the mama in labor chooses a mantra that will help her when she most needs it. For some, this is a more tangible, more helpful tool than visualizations might be. It gives her a physical task as well as repeating a mantra. Mamas can use one bead per breath, one bead (or several) during a surge, or can chant her mantra between contractions to help focus her mind and calm her body. The 108 beads represent the 108 energy lines that converge from the heart chakra. This number also represents the 108 Indian Goddess names. Additionally, the diameter of the sun is 108 times the diameter of the earth. The eastern rosary also has 108 beads. There are 54 letters in the Sanskrit alphabet (masculine-Shiva + Feminine-Shakti) totaling 108. According to Tibetan culture there are 108 worldly sins. Sanskrit for sound, syllable, word or group of words, a mantra is a personal motto of sorts. It serves to create focus and self-transformation. Repeating a personal mantra allows the meditator to calm her mind, allowing deeper feelings of relaxation and awareness. Whatever you choose will be ingrained in your beads, body, mind and soul. 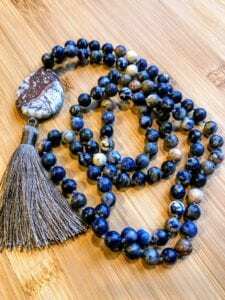 While I was making my first mala, I chanted “Let it be” as the mantra. Creating your own for mantra for your mala is part of what makes it yours-and an effective tool for meditation. Each mala has it’s own mantra-and you can own multiple malas for manifesting many different things. Hold mala beads in your left hand, rest the beads between your middle finger and thumb. Begin reciting your chosen mantra, counting each repetition by moving to the next bead. When you reach the guru bead, flip the mall around 180 degrees then continue in the same direction- never cross the guru! To learn more about making a mala, or to purchase a mala made by Amy, please call 720-323-3609.